Recently, the Philadelphia Phillies, who recently had the greatest run of success in the franchise's time (a very long time, having started up in 1883) fired their manager, Charlie Manuel. It is clear, by most accounts, that Manuel was the greatest manager in team's history. It is equally clear, from my vantage point as a follower of the team since about 1978, that he was the most beloved. Instead, Ruben Amaro, Jr., the general manager of the team, decided to fire Manuel with forty-some games left in the season. His reasoning? They wanted to bring in the next expected manager, Ryne Sandberg (a great guy and a great manager and Hall-of-Famer, to boot) as an interim manager, to see how he would do for the last few games of a desolate season. The more I think about this, the more angry it makes me. Amaro announced this at a press conference. He even started to get choked-up, saying how much he loves Charlie Manuel. The underlying message: It's just business. The old, "It's not personal." Amaro wants us to accept that this move is what's best for the team. Oh, and it was supposed to be alright because they team offered Manuel an advisory position until the end of the season (which I think he, justifiably, turned down). This philosophy pervades organizational thinking: If something needs to be done, it needs to be done. Nothing matters but the welfare of the organization. But, see, it is personal. Amaro's actions and his sappy behavior at the press conference -- the anemic performance that was supposed to make us say, "Oh well, he is thinking of the team" -- is sad, weak and it indicates another turn toward a cultural groupthink mentality. This is all really disturbing, to me, as an indicator of human principles. Forty-some more games to go...we couldn't give him that after all he has given the team and the city of Philadelphia? Once again, the individual is rendered insignificant and unimportant: "Well, he's going, anyway, so let's be practical. His feelings don't matter. We have a chance to watch our next manager for forty games before we commit to him. It's logical." This does not have to be about baseball. Plug in any situation in which an individual has "given his all" to an organization -- the person who is, for instance, laid-off from a company after decades of service without so much as a gold watch and a pat on the back. It happens every day because, for the love of God, we need to protect the organization. I'm telling you, people: If we don't start to value the individual again, we're lost. We might already be lost. When this happens in sports, it becomes (as many things do in sports) what we are teaching our children. That frightens me. And people's relative silence on this? -- further proof that the hive-mind is settling in. I know. I'm a wacko. And so was Orwell. And so was Wells. I'm more familiar in the business environment than the sports environment. I asked myself after waiting a few days to see if new information would come about: "Why aren't they giving him much more for his 'going away'?" I can see that it's not so much environment, but environmental control. The last person my uncle had fired from his company was already approaching retirement age -- worked there for about 40 years. Needless to say, everyone chipped in more than their fair share of cash to shower him in all he deserved for having spent more than half of his life with the company. Half of his life; imagine that. An individual has more value than a group, and an individual's life can't be checked off on the clipboard. Amara and fans: Life isn't business. Give him the goodbye, not just the door. Thanks very much for commenting, Lex. And I love what you said: "an individual's life can't be checked off on the clipboard." 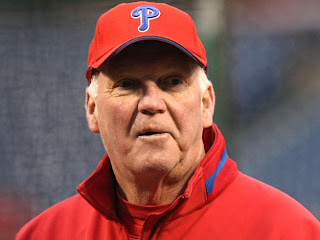 Here's hoping the Phillies do come around and do something for Charlie, but, sadly, it can't erase the offense committed. Indeed: "life isn't business." So well said.